Starting with the Winter Marathon Rally in January and ending with the Classic 12 Hours Sebring in November, Sports Car Digest covered a diverse range of historic car races and rallies in 2016. Our award-winning team of photographers took tens of thousands of pictures, spending hours post-event analyzing and choosing the best ones in an effort to wow our readers. To celebrate the effect that these photographs have on us as well as the dozens of talented photographers who capture them, we have once again narrowed it down to the 50 best vintage racing pictures of the year. Identifying the top 50 certainly wasn’t a walk in the park, as the shots worthy of high praise number not in the dozens but in the many hundreds. The list is done, however, and similar to our Best of 2009, Best of 2010, Best of 2011, Best of 2012, Best of 2013, Best of 2014 and Best of 2015 contests, we are asking for your assistance picking the best vintage car racing photo from 2016. Simply vote by leaving a comment below indicating which photo is your favorite image. If you feel that we’ve overlooked a particular picture, please nominate a candidate by linking to the picture in your comment. We will announce the winner in the January 18th edition of our newsletter and in the comment section. We hope you enjoy the top 50 best pictures of 2016, sorted by the date taken. “Slippery AC Cobra at the Goodwood Revival (photo: Julien Mahiels)”. Everything classic car racing is all about. Having fun on faboulous Goodwood. Fun for the driver and fun for the spectator. I like the Bentley splashing but for me the Porsche on the Peking rally symbolizes that type of racing, so I’d choose the Porsche. I agree those two hit me the hardest, but I love the Porsche 356 with it’s nose airborne in the Peking rally! It’s the one I would want on my wall. I agree is this picture available for a wall I was fortunate enough to see these cars race miss those days. I agree the Tight Formation of the Aston Martin and two Healeys is my favorite. Definitively belongs on the wall for the memorabilia of the antiquities. To imagine the sweet sound of those engines at full chat is still heart stopping. Indeed, I send the vote! Love that crossed-up Darracq. My vote! Without drivers all of these cars would be in museums. This picture of the driver magnifies the vintage spirit! Also love the Darracq. My vote too. The picture immediately grabbed me because of the danger, the risks, the hard work that is captured so well by the photographer. What a car, what a driver! A vote for “Slippery AC Cobra at the Goodwood Revival (photo: Julien Mahiels)”. Really though it is a vote in appreciation of Julien’s use of light in his compositions to bring us a selection of unique images. Well done Julien. I would like to cast my vote for the Bentley at the Scotsman. Open vintage racing, splashing through, has my vote. Absolutely agree. While all the photos are award worthy, this one stopped me in my tracks (no pun…well maybe a small one…. intended) as it seemed to have been painted on canvas. It has the look of being done relative to the subjects’ age, and tells a wonderful timeless story. It could hang proudly in any setting. I second this one. It looks like a painting. My vote too–love the light. and the challenges the drivers and mechanics had to endure at all costs to win. The headlights on adds a warmth and purpose. The photo is taken at just the right millisecond for the splash to be perfect! 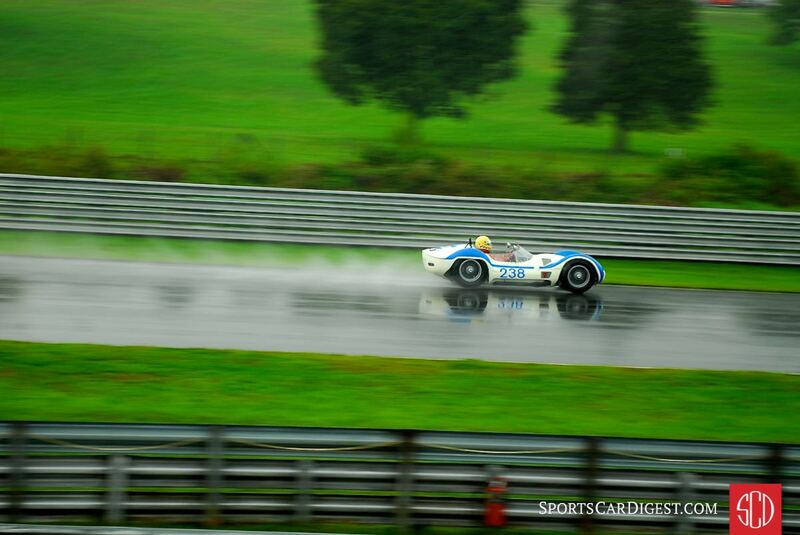 What I enjoy most about Sports car Digest is the great photographers, their incredible work and their timing! The Bentley Super Sports wins hands down. I can almost feel the water spray running down my neck! Once again, it is difficult this year to choose one of these images as the best vintage car racing image for SCD. It’s even more difficult when 4 of my images are also being considered. After looking at all the images submitted, several times I might add, my choice goes towards the Jaguar XJR-14 at the Silverstone Classic captured by Matt White. The colors and composition are just amazing! 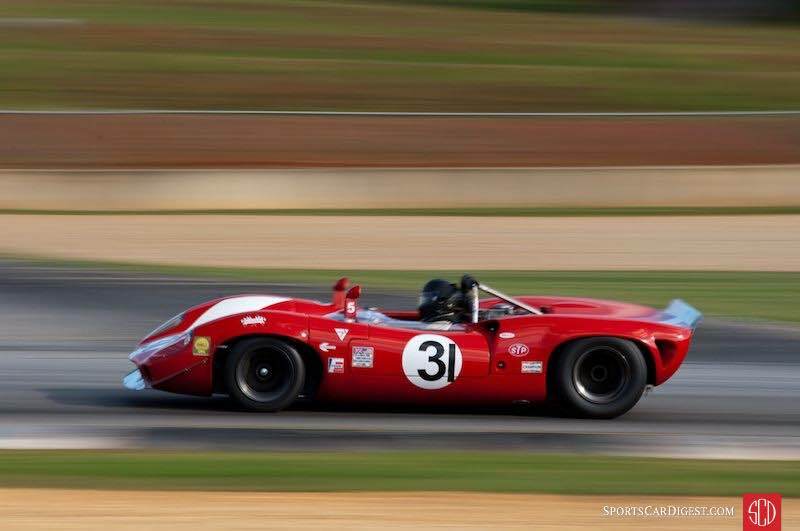 Other noteworthy images are of the Maserati 250F at the LSR Invitational and the McLaren M6A at the Monterey Motorsports Reunion captured by Dennis Gray. And Julien Mahiels’ images of the Porsche 917K at the Goodwood Members Meeting and the Lots of Italian red in the Richmond Trophy at Goodwood Revival were standouts for me. Congrats to all the great images that were selected for consideration for SCD’s Best Vintage Car Racing Photo of 2016. Sports Racers at Old Timers GP. I agree. A stunning photo! The Jaguar XJR14 by Matt White gets my vote , wonderful shot. I would have been thrilled if I had taken almost any of the photos that we had to choose from. Your photographers are immensely talented and amaze me every week. All of us who subscribe to SCD are lucky to get the feast for the eyes we receive in our inbox every week and I have to thank SCD for that. You all are wonderful. I respectfully request to award two photos with the top prize since I can’t choose between them! First of all from a color photography point of view the Jaguar XJR-14 at the Silverstone Classic by Matt White is absolutely stunning. But then from a cool as can be point of view the Crossed-up 1905 Darracq 200hp at the Goodwood Members Meeting by Tim Scott also blows me away. To see anyone driving a 1905 car that hard with all the onlookers in the background is simply amazing and frankly what it’s all about. My hats off to both photographers as well as to your website and newsletter once again. For me, the best is Alfa Romeo T33/3 at the Spa Classic (photo: Julien Mahiels), Stunning photo, expressing speed, amd movement……is racing. Tight formation at the Silverstone Classic (photo: Matt White) The Bentley making a splash was a close second!! Tremendous photographs by all. Also loved the Jag and Austin Healey at the Mille. The start of the RAC Touring Trophy Celebration at the Goodwood Revival is my favourite. The Cobras, Light weight E types and Costin Coupe epitomise their era. Thanks for the superb photos. To be a perfect pedant only one of the chosen photos shows a ‘vintage’ motor car – the Bentley in a puddle. The rest are ‘post war classics’ with one ‘Edwardian’! My favourite is the Shelby Cobra getting a bit squirrelly on the way into Lavant at the Revival. You wonder if he got it back into shape or rotated and the patterns in the spray are interesting. For me, the Darracq action shot is everything that classic racing is about. A lot of the other shots are of beautiful cars but they could be stationary! Hard to select just one picture, but the Datsun 240Z on the 8,500-mile Peking to Paris (photo: Gerard Brown) does it for me. Fantastic image – I can almost hear the engine screaming and the stones and gravel flying!! No.1 Tight formation at the Silverstone Classic – PROPER racers! 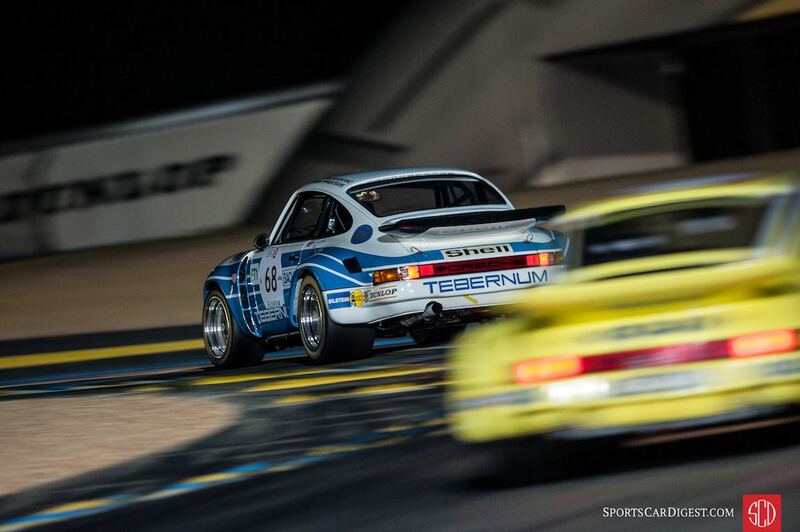 Porsche 911 Carrera RSR 3.0 at Le Mans Classic is such a beautiful picture. Crossed-up 1905 Darracq shows an amazing mixture of fragility, brawn, and skill. Great photos once again! My pick: Bentley Super Sports makes a splash at the Flying Scotsman Rally (photo: Gerard Brown). My choice is for best photo is the Bentely Super Sports taken at the Flying Dutchman Rally. This photo captures, for me, the visceral nature of racing. Second try to contact you. These bring back memories: weeks in the shop and on the road, then the track. You do it for us, to us! Sports racers at the Oldtimer Grand Prix (photo: Julien Mahiels). Timeless. So many great action pics, some truly works of art, but the one that captures the “essence” of vintage racing to me is “Tight Formation” by Matt White. So many great photos this year, it’s almost impossible to choose just one. These are the ones that I thought were amazing photos, or captured what I love about vintage cars. a) Crossed-up 1905 Darracq 200hp at the Goodwood Members Meeting – hands down this is the best. That car is 111 years old ! Thank you for always presenting such exceptional photography. My vote is for the fire breathing, rip snorting Audi DTM. The Audi is actually an SCCA GTO car, not DTM. Says it on the side of the car in the picture. Was absolutely dominant, and then was outlawed because nothing could compete with it. Great images but my heart goes with Greenwood Corvette in Le Mans Classic. Jaguar XJR-14 at Silverstone, Matt White photographer. Hard to imagine a more amazing color collage backgrounding an amazing and wonderfully seductive shape. Very difficult to choose. 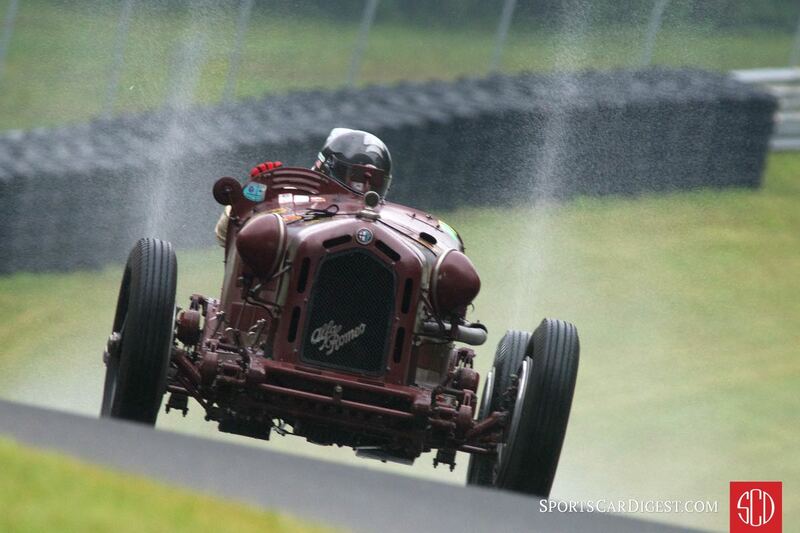 My favorite is the ‘Bentley Super Sports makes a splash at the Flying Scotsman Rally’. My favorit is «Bentley Super sports makes a splash at The Flying Scotsman Rally (photo Gerad Browm)». I think it illustrates the true spirit of the classic car competitions. McLaren M8F at the Mitty! Definitly, a vote for the photo of the 1905 Darracq which shows the history of man defying his machines… like the old commercial: you´ve come a long way baby!!! The Scarab MK1 Embodied a higher level of private involvement in 60’s racing. Probably the ultimate California effort. By far the best looking cars, paint scheme etc. color of the day. To this day ones’ eye is drawn to it immediately. Crossed-up 1905 Darracq 200hp at the Goodwood Members Meeting (photo: Tim Scott). 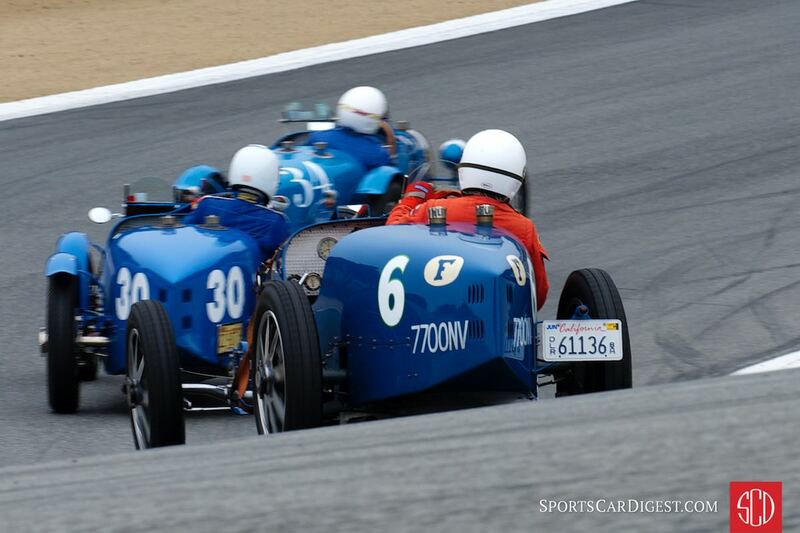 Hard to pick one out of all these great nominees, but this Scott’s photo captures the essence of vintage car racing. Porsche 962 at Silverstone Classic is my pick. Thanks for all the great photos, difficult to pick just one. Bentley Super Sport/Scotsman Rally. Many great pics here! Not that I’m complaining, mind you, but you fellows certainly make choosing a favorite difficult. Thanks to your photographers’ keen eyes, we have an embarrassment of riches arrayed before us, as in previous years. If I must make but one choice, the one that speaks to me the strongest is Gerard Brown’s shot of a 356A at the Peking to Paris Rally – seeing any Porsche in this position is fairly unusual, and he captures some intense motion and energy here; framing the classic-car-at-speed in the foreground against the timeless desert in the background presents a unique opportunity, and he gives us a moment that is historic, dramatic, archival, artistic, dangerous, dynamic and heartening at the same time; and of course, his understanding of composition, light and circumstance in the pursuit of his mind’s eye displays a superb and sophisticated instinct. Well done, sir. And to all of you. Thanks, SCG, for making this exercise a dilemma I look forward to every year. WOW! Too many excellent shots but as a Ferrari nut I’ll go with the SWB at Tour Auto. There are no wrong answers! January 12, 2017 at 9:32 a.m. Dynamic Shadow DN4 duo at the Mitty – Great pic, great team. Lots of good stuff here, but my absolute favorite is the 4.5 litre Bentley Super Sport “making a splash.” A superb vintage moment that could almost be a painting. Have to vote for the 300SL. 91. Thrilled to see the car on the street in San Diego one day. Great car, nice people. It is difficult for me to choose between these beautiful photos. Anyway I really like the Maserati 250F at the LSR Invitational, maybe because that car is one of the most beautiful race cars ever built. Congratulations to all the photographers of the team and thanks for another year of filling us with so much pleasure. 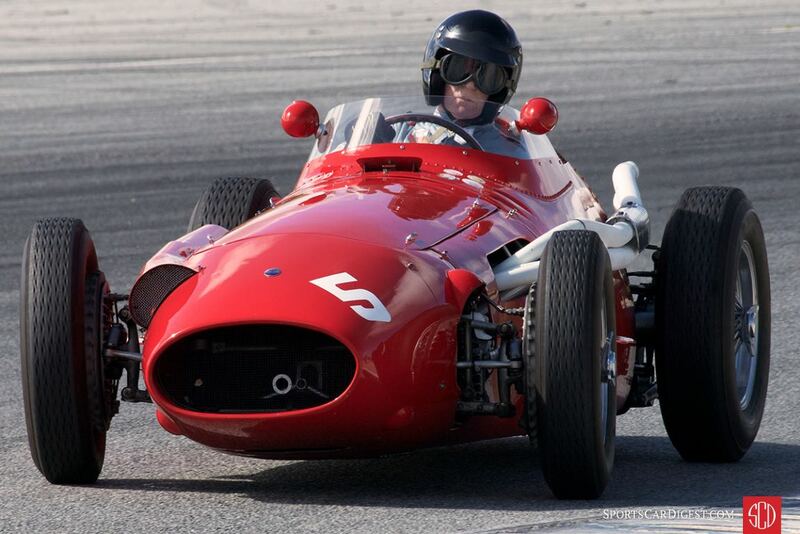 Maserati 250F at the LSR Invitational. Perfect color, depth, and focus, with just a tiny blur on the front tires expressing motion…and an excellent demonstration of Ackermann, either that or a bent steering arm! Thank you Sports Car Digest, for bringing such wonderful events and talent to all of us. I had a conversation with another photographer, Is it the Car or the beauty of the shot? I believe it is both. My picks, and I will say I admire Juliens Mahiels use of light and flow of the track and car. 3- Gerald Browns- Bentley at The Flying Scottsman. I must mention- Matt White and that excellent shot of the Jaguar XTR, Crossed up by Tim Scott, and that Incredible Alfa T33/3 . Dennis Gray’s wonderful shot of the Maserati 250. Love the color and the detail. You already picked the best one as your lead image for the article — Start of the Kinrara Trophy race at the Goodwood Revival. When it ran months ago, I made it my desktop picture for a time. I got overtaken by that thing during that race and it felt like I was going backwards!!!!! For 2016 I will vote for the Bentley framed in water droplets. (if for emotional reasons though I would go with the Scarab as it was the very first race car I had anything to do with back when it was first built). Having raced a Vintage Bentley in the past for many years, this has to be it! Too bad there are not more Vintage Bentley choices. Very difficult to choose between ‘Tight Formation Silverstone Classic,’ technically and artistically brilliant and ‘Bentley Super Sports Flying Scotsman Rally.’ For me the Bentley just takes first place – you look at the photo, you hear that big booming Bentley noise and you know that a muddy shower is going to hit you ! There were many beautiful shots, all well done making it difficult to assess which was actually the best of all. For that reason I have rated my choices as one through four, with one being my first choice of the best at what most expresses what vintage racing and rallying is all about. Thanks for sharing these. What a wonderful collection of images from a very talented group of photographers. Not a bad shot in the group, all conveying a different message. I must agree with those who selected Matt White’s shot of the Jag XJR14 for its composition and brilliant colors…and Tim Scott’s photo of the crossed-up Darracq at Goodwood…amazing to see a centenarian being driven in anger…That must have been a sight to behold! Congratulations to all of these shooters – I wish I could do a fraction as well! Have to say Tight Formation, reminds me of my “Big Healeys” days!!! Being a lover of cars and Vintage Racing it would be like a parent having to decide which was their favorite child. Porsche 917K would have to get the first nod. As an automotive artist, the lines of that car evoke emotions of brute power combined with true sculpture. The car moves when it’s standing still. Next, would have to be the Formula One cars of the 50’s, Maserati, Ferrari, Alfa Romeo. Cars that dared the driver to master them. Then, there are the obvious with any Shelbys and Porsches leading the way. What an enjoyable poser. A very difficult task, but as a Porsche 911 fan, my favourite is the Porsche 911 Carrera RSR 3.0 at Le Mans Classic (photo: Julien Mahiels). This is a list of the photographs that caught my attention and had me looking at the details for awhile, with my thoughts on each. Page 1, the crossed up Darracq, by Tim Scott. What’s not to like about this image? I love the 3 “horizons”: the splash, the near ridge and the far ridge. A perfectly captured moment. Superb! My only issue with this shot is that it’s not centered as well as I would like it to be. I love the fact that this picture, while a moment in time, captures the passage of the car with the dust contrail. Julien is a favorite of mine. He has a great eye for framing his shots, and this, in my opinion, is the best example of a beautifully framed shot from this year’s nominees. A special nod to Julien for what is probably the most difficult shot to capture among this year’s nominees, lighting, focus and action all captured perfectly. So, for me it came down to Tim Scott’s Darracq and Gerard’s Bentley, and to be honest, I can’t decide. I’d love to have both of these images hanging on my wall. Therefore 1/2 vote for each! And a vote for making these images available for purchase in 8.5 x 11 or 11 x 17, suitable for framing! Crossed-up 1905 Darracq 200hp at the Goodwood Members Meeting (photo: Tim Scott) gets my vote! The body language on both the car and the driver! I’m going to vote for the crossed-up Darracq at Goodwood. It captures a primitive, if not ancient, effort to keep control of a race car in this marvelous sport, a rare image of an old battle that’s changed and yet not. Porsche 356 A Coupe on the 8500 Mile Peking to Paris Rally, what a ride that must have been. Crossed-up 1905 Darracq 200hp at the Goodwood Members Meeting (photo: Tim Scott) is my pick in this contest. Many outstanding photos but for me the Bentley in the mud in Scotland is the clear winner. Flaming Audi DTM at the Oldtimer Grand Prix (photo: Julien Mahiels)–The image brought back fond memories of my taking photographs (yes, prior to digital cameras! ), of Hans Stuck at Lime Rock Park driving the Audi. Thanks for SCD and all photographers!! Jaguar XJR-14 at Siiverstone, but that crossed-up 1905 Darracq at Goodwood was a close second. Bentley Super Sports makes a splash at the Flying Scotsman Rally (photo: Gerard Brown). Bentley Super Sport and Porsche 356A, both by Gerad Brown nailed the visceral excitement of racing. Also loved the Jaguar XJR-14 by Matt White, great composition, a perfect “poster” photo. Toss up between the E-Type leading the Cobra, but I think my favorite is the C-Type in front of the big Healey on Mille. I’m a sucker for Jags. lots of Italian Red is a terrific photo. Bentley Super Sports makes a splash at the Flying Scotsman Rally (photo: Gerard Brown), a difficult decision, but it has to be only one. I find it difficult to pick only one. 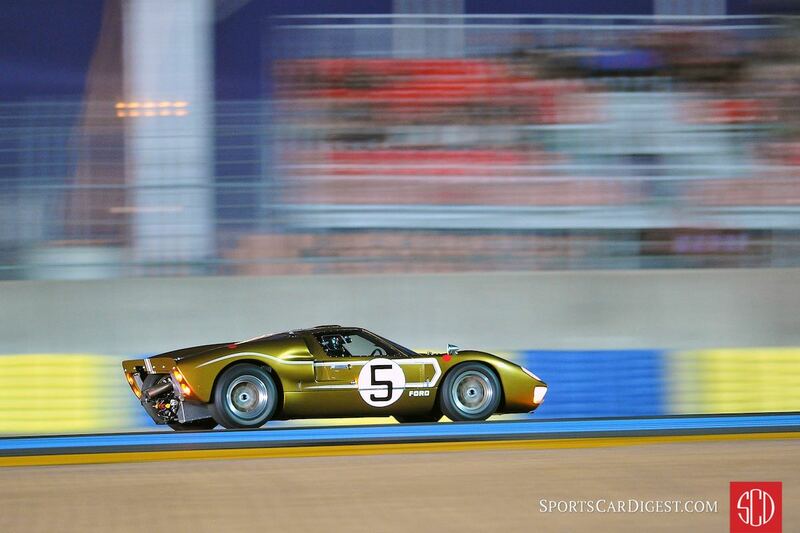 However, I will vote for the yellow / black striped Ford GT40 from Goodwood. Have long longed for those cars! I will second that vote – awesome colors, lighting, the car itself, the venue and the significance of the 50th anniversary year for the GT 40. With that said, the overall album of photos was really impressive. My vote goes to the Alfa Romeo T33/3 at the Spa Classic. El oportunismo del fotógrafo para captar el instante , el encuadre de la foto; los claroscuros ! Una obra de arte ! As much as I love Dennis Gray’s photography, this I’m voting for the crossed-up 1905 Darracq. THAT is a REAL vintage car! Tight formation at the Silverstone Classic (photo: Matt White). The picture where the tension between racing drivers and the cars is great. And iconic cars on a famous playground! I wish to make a picture like this one once! Thank you Con for sharing the link on the Darracq. I enjoyed it enormously! The Bentley Super Sport at the Flying Scotsman Rally has my vote! Two gents having absolute fun in an evocative car in conditions to make a Concours entrant cringe! Great Stuff! When you look for Vintage Racing or Racing Teams, I think of Gulf Porsche 917’s who won in the 70’s and placed : 1-2-3. 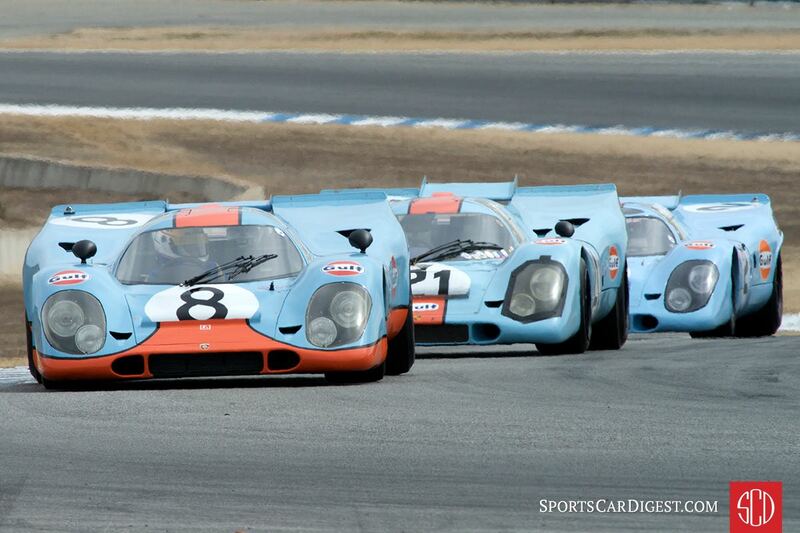 Dennis Gray’s picture of three iconic Gulf Porsche 917s at Rennsport Reunion as our best vintage car racing photo. Crossed -up 1905 Darracq: Oversteer? Understeer? Am I leaning the wrong way? My back hurts! Bentley through the puddle works best for me, beautiful photo. McLaren M8F at Mitty,you can almost feel the cornering forces.I loved these as a kid and still do at 60 years old,should go up soon. It was a hard decision! So many great shots that it is almost impossible to choose – might there be the making of a coffee table book there? Anyway, and because choosing we had to, my favorite this year is the Datsun 240Z on the 8,500-mile Peking to Paris from Gerard Brown – that plume of dust….. Stunning. And well done to all again! Gerard Brown’s Bentley Super Sport splashing through the puddle: one of the most magnificent photos I’ve ever seen of ANY subject! It has perfect exposure, subject, action, perspective, composition– it’s brilliant! The Bentley in the mud puddle does it for me! Thank you for the joy you bring me every week. As son of the former Dutch racing driver Lex Beels (1918 – + 2005), who actively raced for a living on the European circuits during his racing career from 1935 till 1960, it is a joy to revive part of my youth, having been on the European racing circuits with him on many occasions, from 1951 to 1961. Many of the later well known Formula 1 drivers started with F3 and were good friends, unfortunately some good friends, as Peter Collins, Mike Stuart, Joachim Bonnier, Wolfgang Berge von Trips, Lorenso Bandini, Carel Gaudin de Beaufort passed away far too early. Beels (own build car) with Jap engine 1951 Winner and 4th place on Avus Germany. He owned 2 cars and had always one or even 2 cars rented out to the following drivers: Pim Richardson, Jack Allison Davis, Will Tervoren, Randy Reece, Rob Slotemaker, Gijs van Lennep (borrowed the Cooper for one race in Zandvoort) and Jos Saveniers a Belgian driver, who raced for the last 3 years for the Beels Racing Team in Formula 3 and Formula Junior. Strangely enough all the racing car constructors went dead silent and didn’t offer any help, apart of Collin Chapman, who wrote us a letter indicating his regrets for what had happened and he offered a brand new Lotus Formula Junior car on credit for the 1960 season, very generously without asking for any money right away. We never forgot this great gesture, which we couldn’t accept and remained good friends. Great story, thanks for sharing with us ! Bentley Super Sports at the Flying Scotsman Rally (photo: Gerard Brown) — page #2. Agree, for me as well the Bentley Super Sports, the picture is just fantastic, a highly dynamic moment completely frozen. Also the colours, composition, outstanding! Beatifull pictures, but I choose Bentley Super Sports makes a splash at the Flying Scotsman Rally (photo: Gerard Brown).. There are so many terrific pictures to choose from. Start of the Kinrara Trophy race at the Goodwood Revival (photo: Julien Mahiels) would be at the top, but the perspective picture at Spa is amazing! How can you beat the sight and sounds of the GTO and Short Wheelbase Ferraris ripping by at Laguna Seca ? My first choice is “Ferrari 250 GT LWB Berlinetta ‘Tour de France’ at the Monterey Motorsports Reunion (photo: Dennis Gray)”. The perspective is chilling and the 250 is blocking a pass. My Second choice is “Ferrari 250 GTO and Ferrari 250 GT SWB Berlinetta at the Monterey Motorsports Reunion (photo: Victor Varela)” Face it, just seeing a 250 GTO makes my heart flutter and adding a 250 GT spices it up even more. 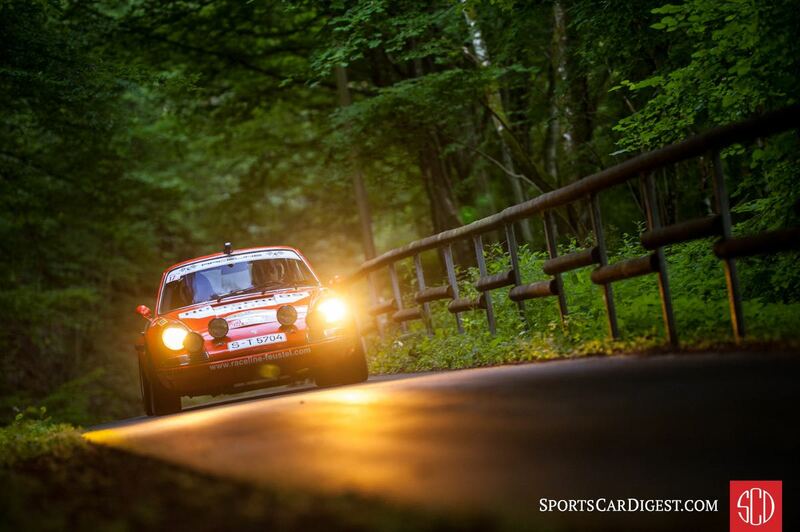 After several reviews of the images selected, I vote for this shot of the Porsches, in the dark with one in tight focus and another, blurred in close pursuit. Start of the Kinrara Trophy race at the Goodwood Revival … I’m guessing I also picked your fav? 1905 Darracq crossed-up. Wonderful picture from a wonderful, inspiring race at Goodwood. And the car is still racing at 111 years old. Love the colors, the blur and the Jag is razor sharp. Alfa T33/3 at Spa, my favorite of many wonderful photos. I would choose the Bentley Super Sports at the Flying Scotsman Rally, photo by Gerard Brown. The way the water is splashing and the “eye” looking headlights bring this picture to life. The 1905 Darracq at Goodwood was a very close second. The driver in that picture looks fearless. This photo is the essence of racing. Mercedes-Benz 300SL Gullwing at the Monterey Motorsports Reunion (photo: Victor Varela) is my favorite. The Splashing Bentley for me. Darracq is second place. So many great shots! I love the #3 cars massive burnout at the ‘Start of the RAC Touring Trophy Celebration at the Goodwood Revival’. The ‘Bentley Super Sports makes a splash at the Flying Scotsman Rally’ is epic. But the ‘Porsche 356A Coupe on the 8,500-mile Peking to Paris’ fighting gravity (and winning!) is just too cool and my #1 favorite. Keep up the great work. I look forward to your magnificent work gracing my inbox every week! Thanks so much for all those beautiful photographs, especially those showing cars in either dramatic off-road action, like the Bentley or the Porsche 356A, or racing on one of those old-type racetracks, like the Nuerburgring or Goodwood. Don’t those photos of the 917K or of the Darraque at Goodwood, or of the 356A at the Pittsburg Vintage Classic, or, finally, of the sports racers racing into the evening sun at the Nürburgring conjure up that glorious past of true road racing, when cars still looked like they could be driven on regular roads? Like at the Targa Florio, for instance? Which is why my favorite photo is the one by Alberto Novelli of the Maserati 450S at the Bernina Grand Turismo hillclimb, the houses in the background looking very much like some at the Targa, and the big 450S being the one Maserati that should have rightfully won the 1957 World Sports Car Championship. So many great pictures but the outstanding photo hands down has to be the crossed-up 1905 Darracq 200hp at the Goodwood Members Meeting (photo: Tim Scott) Just exceptional ! Best of the bunch is Crossed-up 1905 Darracq 200hp at the Goodwood Members Meeting (photo: Tim Scott)…. difficult to choose who would be in second place though? Dynamic Shadow DN4 duo at the Mitty (photo by David Ferguson is my pick. I’mean a little bias, since this was prior to Craig crashing in that car. For photographic excellence, I like the Alfa T33 @ Spa. For content, I choose the Lancia D50’s at Lime Rock Historics because how often will we ever see two D50’s racing again! One hell of a shot! Amazing! Love this picture – it reminds me of when I was there! the crossed-up 1905 Darracq, whilst hard to spell, is an unbelievably vital and beautiful photograph. Well done to Tim Scott. ‘Crossed Up Darracq’ gets my vote. Fine work Mr Scott. Matt White’s capture of the Jaguar XJR-14 at Silverstone stands out among the many great choices. Among the images that made this a difficult selection are Tim Scott’s crossed up Darracq and Julien Mahiel’s Ford GT40 at the Goodwood members meeting. I can practically feel the earth shake. Jaguar XJR-14 at the Silverstone Classic (photo: Matt White) is superb and definitely gains my vote. A radiator, engine, skinny wheels and driver – the essence of auto racing. Bentley Supersports at the Flying Scotsman Rally photo G Brown is one of my favorits. Sooooo many great photos captured by outstanding photographers, but I will take the All American Greenwood Corvette at Le Mans!!! Outstanding image with lighting, shadows, and sillouett of a car with an interesting story! After a record number of overall votes, readers chose Gerard Brown’s outstanding capture (page two) of the Bentley Super Sports making a splash at the Flying Scotsman Rally as our best vintage car racing photo of 2016. The second favorite image was Tim Scott’s impressive photo of the crossed-up 1905 Darracq 200hp (page one) at the Goodwood Members Meeting, followed by Matt White’s stunner (page six) of the Jaguar XJR-14 at the Silverstone Classic. Thanks for all the thoughtful comments and votes. They were as fun to read as looking at the pictures. Many, but has to be the outstanding Julien Mahiels shot of the Gp IV Ferrari 308 at the Eifel Rally. Great clarity, composition and depth of field. Superb shot! Congrats! While I heartily endorsed the top two finishers, having given each 1/2 of my vote, the bronze medalist surprised me. Not that it didn’t deserve the podium, but that I had overlooked it in the 1st place. It didn’t even make my “top 6”. As the vote notifications poured in, and many were for the XJR-14, I went back to find it and when I did, I thought “how the heck did I miss that”. It is a gorgeous image and well deserving of the podium. Congratulations to Gerard Brown, Tim Scott and Matt White. All are worthy of the #1 spot. 3 completely different vehicles and eras, 3 completely different settings and 3 completely different actions, and yet all 3 photos are so outstanding. I’d be curious to know how close the voting was among these 3. Should have paid attention and noted the voting was over! !